Successfully Added Car Video Recorder with Laser Indication Light to your Shopping Cart. Designed to be mounted on a car dashboard, and enables you to capture video or images of road situations. Useful for insurance purposes or even law enforcement. Or just fun! This model comes with a built in red laser pointer for aiming the camera's line of sight. You can download your videos by removing the SD card downloading your recorded video footage using a memory card reader. This is a simple plug and play device, making it easy to use without the any software installation whatsoever. Simply insert your SD card and start recording all your driving adventures. This unit records videos at a computer friendly 320x240 and AVI format for fast playback viewing. this car camera makes recording and archiving your videos easy. With its use of a standard SD memory card slot, you can insert a your SD card and simply push the record button when you start your drive and then you can easily push stop and remove the card when you arrive at your destination, insert it into your computer, transfer your video files, and then take the card back out to your vehicle and place it into the camera and start a new recording session when you drive out again. No need to ever remove the camera from your vehicle. This unit is in stock now and available for single sample or bulk orders. 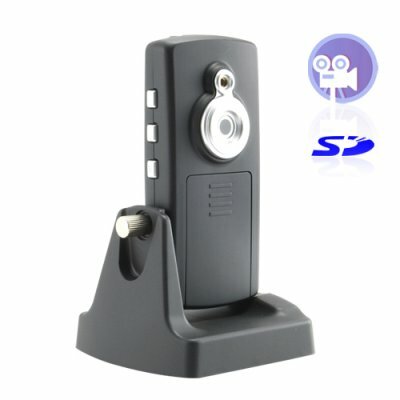 This car video camera is proudly brought to you by the leaders in factory direct wholesale electronics, Chinavasion. - Low Power Indicator, Record Indicator, SD Card Slot, Power Button, Play Buttons, Brightness Button, AAA Battery Housing, TV Out, DC Out, Mounting Tripod Screw IN. Using the provided AV cable you can connect the camera to a car monitor such as a Car DVD Player and view the video capture live. This camera has no internal memory, and does not come with a SD/MMC card. Please insert a SD/MMC card before recording. What will happen if the SC card becomes full, and there is no more space to record, will the video camera stop recording automatically? This camera records in cycles. When the storage medium is full, it will record from the initial condition and cover the previous recorded file automatically. How will I know if the car video camera is running low in power? Works very well, quality more than adequate for its requirements. No sound, which would be beneficial, but would probably increase cost considerably. Highly recommended for use in insurance/legal disputes. Very nice and simple yet effective device. I put one in the fron of the car and will buy one more for the back, just in case of being rear ended. Would be nice if the camer could stay on all the time with dc power. This is what i have been looking for, pls update the price soon. Thank you.